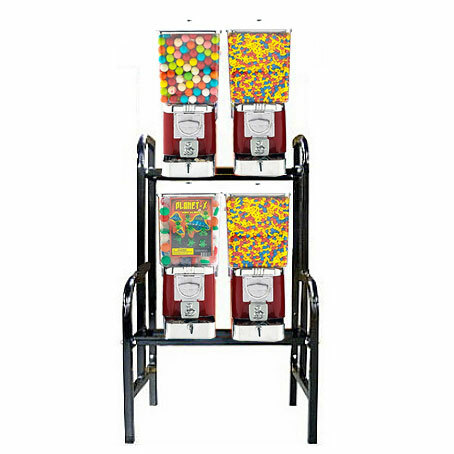 A self-contained mini bulk vending center, this 4-unit vending rack is competitively priced and ideal for the serious bulk vending operator. Offering flexibility and variety in products would be highly appreciated by your clientele, which means better profits for you. The products typically vend for 25¢ but some 1" Acorn Capsules can vend for 50¢ so you may select this in the coin mechanism options when you're ready to buy. The bulk vending machines are proven workhorses in the industry with streamlined design and security. They are easily serviced and maintained with replacement parts readily available in the USA. Enjoy lifetime warranty on the coin mechanism excepting vandalism.